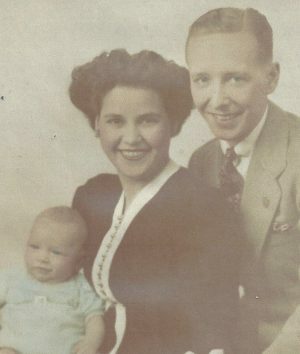 FULTON, NY – Ending a long and fruitful life that wove through World War I, the Great Depression, World War II, the Golden Age of America and the Contemporary Period, Ernestine (Lorini) Pomeroy, 98, of Fulton, passed away peacefully on Wednesday October 5, 2016. Ernie was a long-time communicant of Our Lady of Perpetual Help Church in Minetto. Ernestine Pomeroy and her husband, Charles, and their son. Ernie was born a coal miner’s daughter in Mingo Junction, Ohio, to Italian immigrants Rose (Paolucci) and Joseph Lorini. One of her earliest memories was listening to her father play Strauss Waltzes on his concertina while her mother, brothers and sisters danced to the tune. She was a charter member of the Rice Creek Field Association. As an avid naturalist, she enjoyed walking, observing and foraging (especially for blueberries and cowslips) on her and her husband’s 50 acre back yard of untouched woodland and wetland with her family and friends over the years. Ernestine was an aficionado of wild flowers, classic literature, poetry and history. She enjoyed summering at the family’s cottage in Fair Haven, NY. She loved baseball and cooking. She was predeceased by her husband, Charles Augustus Pomeroy, in 2000; her son, David Roland, in 1997; three brothers and four sisters. Ernie is survived by her grandson, Eric Charles and granddaughter-in-law (who is expecting in November) L. Michelle (Doerner) of Toronto, Canada; and her beloved daughter-in-law, Eunice “The Great” (Demperio) of Rochester, NY; as well as multiple nieces and nephews. A Mass of Christian Burial will be celebrated on Saturday, October 15, at 10 a.m. at Our Lady of Perpetual Help, 2912 Route 48, Minetto. Entombment will follow at St. Peter Cemetery and Mausoleum. Rip Ernie. I will miss you. Thank you for being my friend. I will always cherish the stories we shared. I am better for knowing you.